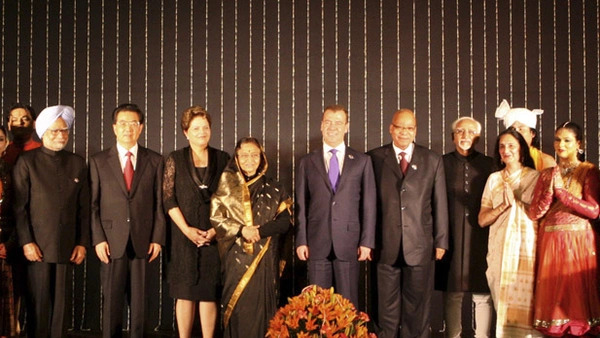 The BRICS India Summit: Beyond Bricolage? This Thursday India hosts the fourth summit of the BRICS nations (Brazil, Russia, India, China, and South Africa), an annual gathering of the leaders of major rising powers. The meeting in New Delhi will expand the BRICS’ agenda beyond its traditional macroeconomic focus to address development, urbanization, and cultural cooperation. The BRICS has been widely heralded as a new geopolitical force. But beyond all the fanfare, what are the prospects that the bloc can turn its surging economic weight into real diplomatic clout? It’s ironic, given their vocal opposition to Western economic dominance, that the “BRICs” got their start on Wall Street. It was back in 2001 that Goldman Sachs banker Jim O’Neill predicted that Brazil, Russia, India, and China would drive global economic growth in the twenty-first century. The concept took on a life of its own, and the four BRIC nations held their first formal meeting in autumn 2006, on the margins of the opening session of the UN General Assembly. It was a curious construction—what the French might call a bricolage, an assemblage of available objects brought together despite their diversity. The group united two vibrant democracies, Brazil and India, alongside two authoritarian states, China and Russia. But if the members lacked a common history or vision, they had at least two things in common: their status as emerging economic powerhouses and their resentment of a global economy they saw stacked in favor of the West. In 2009, the BRIC nations elevated their annual meetings from the foreign ministers to the head of state level, holding their first formal summit in the central Russian city of Yekaterinburg. That gathering produced a sixteen-point declaration focused on the financial crisis. The next two summits, held in Brazil and China, expanded the substantive agenda—and the length of the communiqué—delving into new areas like climate change and global trade. Its membership has also increased. This year the original quartet will be joined by South Africa, creating a coalition of states spanning four continents. The India summit seems likely to yield at least one concrete outcome: the creation of a new BRICS development bank designed to coordinate foreign assistance and gradually diminish the global South’s reliance on western aid. Only days after the Obama administration stuck with tradition and nominated an American to lead the World Bank, rising powers are more determined to enact the plan. The envisioned bank would channel aid to countries and issues that the bloc deems priorities. The bigger uncertainty is whether there is enough “mortar” binding these BRICS to allow them to become a cohesive political force on the world stage, prepared to adopt common foreign policy positions beyond a narrow range of issues—such as the need to end the monopoly of the dollar as the world’s major reserve currency. Some have even predicted that the BRICS could emerge as an important caucus within the Group of Twenty (G20), providing a competing center of gravity to the G7 nations. This would be unfortunate, since it would undermine one of the great advantages of the G20—its potential to shake up traditional global alignments by creating new, more flexible forms of cooperation across developed and developing countries. Such fears may be unwarranted, however. For the evidence suggests there may be as much that divides the BRICS as unites them. To be sure, the BRICS have staked out some common positions. All five members lean toward traditional conceptions of state sovereignty and nonintervention, and have occasionally resisted what they consider heavy-handed U.S. and Western tactics. China and India, which rely heavily on imports of crude oil from Iran, have resisted international pressure on that country. And all the BRICS have proclaimed that they are “not bound by unilateral sanctions” imposed by the West. On the other hand, the BRICS have failed to reach a common position on Syria. Russia and China have twice vetoed resolutions against the Assad regime, while India, South Africa, and Brazil have either voted in favor or have not voted at all. Over the longer term, geopolitical rivalry is likely to limit substantive security cooperation among the BRICS. This is particularly true when it comes to increasing regional competitors China and India, but similar frictions may well emerge between Russia and China in the Far East, particularly given demographic trends. Finally, political divisions might yet scuttle the plan for the development bank—as occurred in 2011 when BRIC nations diverged on the effort to install a non-European head as managing director of the International Monetary Fund. To date, the few tangible joint strategies proposed at BRICS summits have had little impact beyond the headlines they generate. The most robust proposals thus far, agreed to at the Sanya Summit in 2011, were to challenge the hegemony of the dollar in global commerce by trading in local currencies, as well as to encourage movement toward use of the SDR as an “international currency.” The Chinese government is pushing the first of these goals in New Delhi, but is likely to backtrack on internationalization of the SDR as it considers its yuan the best contender to replace the greenback. The catch-all theme of “Stability, Security, and Growth” selected by the Indian government for this week’s summit also points to the amorphous nature of the alliance. Stability refers both to finance and trade as well as “stability from governance failures.” Security encompasses energy and environment, infrastructure, and equal opportunities without class, gender, or regional discrimination. Growth refers to market and technological development. However, the document prefaces the tripartite goal with the caveat, “it is always simplistic to attempt to capture the broad and rich arena that current developments offer the BRICS nations to collaborate on.” This statement highlights the amorphous nature of the bloc, whose purpose even the BRICS leaders cannot—and may not wish to—define. Without question, the BRICS coalition expands the diplomatic range of maneuver of each rising power and is a symbol of changing times. At the same time, the body is unlikely to become a strong geopolitical force. Its members will align periodically, using the bloc to demand greater representation in established institutions like the IMF or World Bank, or to push back against Western dominance. But they will also steer clear of the forum when it comes to issues that divide them, such as UN Security Council expansion.